Parents (mothers on the girls’ side and/or fathers on the boys’ side) are received by the respective administrators. The administrator gives an initial introduction of the school and explains the admission process. A fee voucher for the registration. 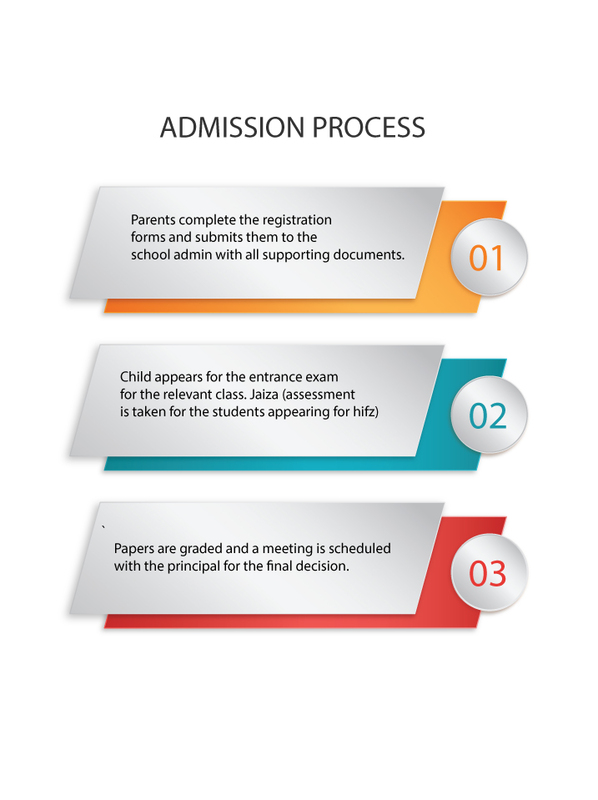 An appointment for the admission test. Assessment test of English and Mathematics is taken for the class which the students is applying for. These assessments are designed to gauge the skill set and the concepts of the students which are later helpful in devising the individual development plan of the student. The administrator arranges for an interview of the parent with the Principal in parallel with the child’s test. The respective teachers grade the test and give their collective recommendation to the Principal, who makes the final decision. All documents should be completed for the financial aid. File is then forwarded to the Principal for review and final decision. After the student is admitted, the administrator hands out a fee voucher, booklist and the uniform vendor information to the parent. A student is allowed to sit in the class after fee deposit confirmation is received from the bank (or the parent shows a paid fee voucher).